I had IVIG treatment today. For the next couple days I will feel fuzzy and foggy — a small sacrifice to endure for a treatment that has given me my life back (and will continue to for years to come because I’ve been doing this for fours years, every four weeks, and there is no foreseeable end). Four hours of lying in a bed with an IV stuck in my arm is a tiny sacrifice to endure to live again. How did it come to be known that IVIG (Intravenous Immunoglobulin) would help immune deficient patients battle whatever disease is attacking their body? This therapy has taken the body that has fallen off a couch, too weak to lift itself up off the floor, the body that has fallen down stairs, legs not strong enough to reach the top, and has transformed that body into one that can walk, do yoga, and swallow with no fear of choking. I’m so grateful, but today, I lay in that hospital bed and wondered about the animals, chimpanzees, in particular. I volunteer at an animal shelter. I feel empathy for neglected, abandoned, and abused animals. I want to take them all home with me and show them what love feels like. I want them to know hands that comfort, and not hurt. I want the dog who has lived its life tied to a tree to know the feeling of the warmth of a bed with soft blankets. I want the dog who almost died from thirst to know there’s a bowl of fresh water, in the same place, anytime he wants it. I want all these things because I hate suffering. I participate in protests against puppy mills, and those pet stores who by from those horrible places (which is most pet stores) because I hate suffering. I changed my eating habits to a (mostly) compassionate diet because I hate suffering. I research companies who test on animals and buy a different brand because I hate suffering. I do all of this because I hate the idea of contributing to the suffering of another living being, and yet, I don’t know if the treatment I go for every month has been tested on animals. A chimpanzee has a 98% genetic similarity to humans. If the therapy I get was tested on an animal to see if it would benefit patients with my disease, (I haven’t yet checked because I don’t want to know. I’m not ready to know. I’m a coward like that) it most likely would have been a chimpanzee. Ironically, my most beloved animal growing up. Stuffed monkeys crowded my room as a kid. My favorite was one where the hands velcroed together so you can sling the arms around your neck and pretend like the monkey was clinging to you. I carried this chimp around my hip all the time. 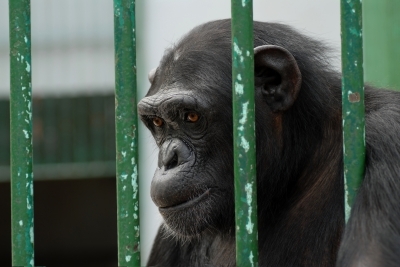 So how fitting would it be if the suffering of a chimpanzee is the reason I feel better? Not fitting at all because the only way a company could test if IVIG would work for my disease (and any disease) is to take a species with a similar functioning healthy immune system and make it sick. Yes, make a healthy and vibrant animal sick for the benefit of a human life — my life — possibly. I don’t believe that animals are here for humans to do with them what they will. Maybe the Bible states Man’s dominion over animals, but I don’t believe everything in the Bible anyway, so I’m comfortable disagreeing. They are not our trophies in a one-player sport, or our entertainment performing a display of tricks while enduring cruel treatment, and, some argue, they aren’t even here to be our food. They are living creatures who know pain and fear, and experience joy and sadness. I’ve heard the heart-wrenching screams of a mother cow as she watches her calf being dragged away only seconds after birth. I’ve watched terror take over a pig when it knows it’s about to be killed in a brutal way — thumping — the industry calls it. I’ve seen cows and Beagles, who have spent their entire lives in cages inside factories, without ever once feeling the sun on their skin, frolic joyfully in the grass for the first time. And when given an option to lay on the floor or a bed piled with pillows, my dog will always choose the bed. Why? Because it’s more comfortable, and animals, even farm animals, recognize comfort over discomfort. Which one do you think they prefer? Today, I lay in a comfortable hospital bed while receiving the fluid that will help my body function as normally as it can, but what conditions were the chimpanzees living in when they were (are) experimented on? I imagine they were forced into small cages, in a bland and cold room, locked up like a prisoner, frightened and sick, not knowing why they are there because they’ve done nothing wrong — except to have the unfortunate luck in sharing enough DNA similarity to perhaps the greediest, self-entitled, and morally inept race alive today. And cowardly, too. That’s my race. That’s me. And maybe some day I’ll be brave enough to know how much suffering (sacrifice) a living being endured so I can have my life back. You give an awful lot back to the animal kingdom, Alicia, so don’t feel bad. It’s not your fault that stupid humanity decided to use animals as lab tools when they could have tried non-animal methods – and there are many organisations doing non-animal research now in the fight against human diseases. I don’t think there’s much we use in our daily life that some idiot scientist hasn’t at some time tested on an animal. Accept what the cosmos has given you because it wanted you to have a healthy life so you could do good! It knew you were worth it. That’s very sweet of you to say, Vicky. And yes, it is sad that some living things have to suffer in this life. We can only hope their pain ends quickly. Thank you for reading my blog and commenting. I really appreciate it. I wish we could prevent all injustices in this world, not just to animals, but humanity and mother earth as well. I know it’s hard not to focus on it as you go through your treatments. In my book, you’re a hero and a truly special person. Because you put the greater good ahead of yourself. With social media the injustices of this world, especially those done to the animal kingdom are so much more in our faces. Obviously, this is good and bad. These viral posts are overwhelming to say the least. For me, when I find that I am getting to a point where I feel like I could go a little insane from it all. I stop and I first take a big breath. Then I focus my mind on a moment in time when I prevented an injustice. I know it’s always easier said than done. And, I can’t even begin to imagine exactly how you feel. But, it has helped me. We can’t save them all, no matter how much we wish we could. I actually feel like the world is out of balance, and it only seems to be getting worse. That is why it’s so important to have people like you in it. Feel strong, keep writing, remember to laugh, even when you feel like crying and never give up hope. Thank you, Vicky. I completely know what you mean about needing to stop and take a breath with all the social media posts out there. It’s all so very sad because it’s feels so personal. It’s so difficult to watch the videos of animals suffering, but I don’t want to live in oblivion, so I watch to remind myself of the pain some living beings go through. It gives me perspective too as to not complain so much about the little things. Previous Previous post: Looking for Someone Other Than My Wife.